T4 (T4-Bacteriophage) under a microscope! The perfect predator, T4 terminates its prey. 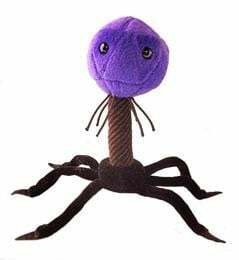 FACTS: T4-bacteriophage may look like something out of a science fiction movie, but if you’re an E. coli bacteria, it is the stuff of your nightmares. This real-life microscopic monster isn’t just hiding under your bed; it’s hunting you, feeling for you with its six deadly feet. When they finally touch your skin and know that you’re there, they grip onto your flesh like talons. Paralyzed with fear, you wait and watch as a tremendous, tusk-like stinger stabs you mercilessly through the middle. Writhing in pain, you feel your predator’s deoxyribonucleic acid (DNA) being injected slowly, menacingly into your very being! You try to resist, of course, but it is futile: your contaminated body starts to grow new copies of the malevolent abomination that has corrupted your soul. In less than an hour, a legion of fiends is swarming inside you. They grow and grow and grow until you are broken, until finally you explode, disappearing into a void of nothingness. By day, T4 has played important roles in a number of scientifically significant experiments. It has hobnobbed with Nobel-prize winning scientists, and has whispered some of the secrets of mutation-genetics to them. It has advanced our understanding of viral infection, and may someday help to control pathogenic bacteria. But don’t let the cool, scientific demeanor fool you. T4 always has one eye on the horizon, watching for the sun to set, waiting for the hunt to begin. They’re being used as an alternative to antibiotics in treating human bacterial infections, in a process called phage therapy. Phage therapy has an advantage over antibiotics because bacteria haven’t developed resistance to it like they have to antibiotics. 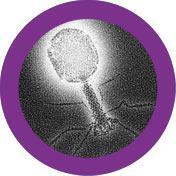 Bacteriophage comes from Greek root words to describe the virus’s ability to “eat” bacteria. T4 will terminate its prey with precision! T4 is about 120 x 86 nanometers. That’s six thousand times smaller than a grain of coffee! A bacteriophage is a virus that attacks bacteria. When the tail fibers detect a target host the bacteriophage attaches to the cell, injects its DNA, and uses the bacteria’s machinery to reproduce. The virions, or dormant viruses, become activated when they come in contact with a target cell. 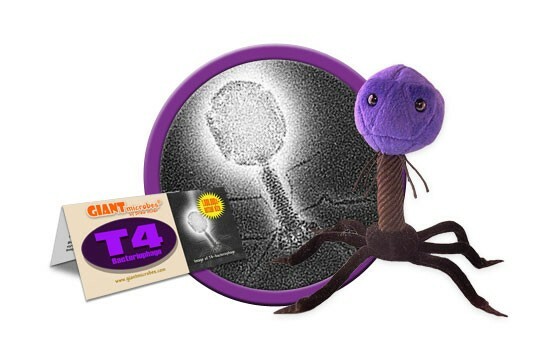 T4 is a type of bacteriophage that infects E. coli. Discovered by Frederick Twort in 1915 and Felix d’Herelle in 1917. Bacteriophages were used to treat bacterial infections, like gangrene and dysentery, during World War II. That’s even earlier than antibiotics!